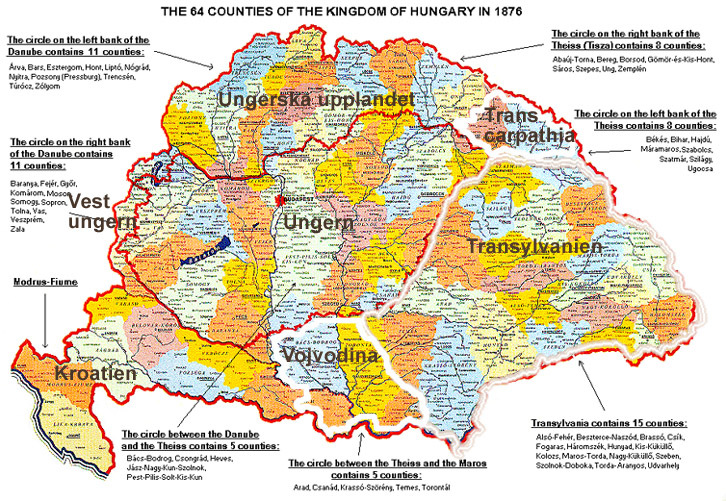 Felvidék/Upper Hungary (nowdays souther part of Slovakia) had been the integral part of the Kingdom of Hungary since 1000 until 1921. At the end of World War I, as part of the Treaty of Trianon, 1920, the Allies annexed Felvidék from Hungary and createed from it CzechoSlovakia (which later separated into two states and now is a part of the Republic of Slovakia. However, the region remains a treasury of the one-thousand-year old Hungarian culture and people in the Carpathian Basin. o after World War I, the meaning in the Hungarian language was restricted to Slovakia only. Geographically, Felvidék lies in the Carpathian Basin. [Webmaster note: The Magyars settled in this part of Europe in the begining of the 9th century. See "Magyar Conquest of Hungary".]" "The phrase "Hungarians of Slovakia" or, the one used earlier, "Hungarians of Czechoslovakia" is a notion and a reality of the twentieth century. Prior to 1918, the segment of the Hungarian nation now inhabiting Slovakia has been in its ancestral homeland for more than a thousand years. This population did not leave their native land, but rather had an imposed border change, sealed against their will at the Treaty of Trianon, 1920 and the Treaty of Paris in 1947. At the time of the first border modification in 1919 the Hungarian population of today's Slovakia was 693,000 representing 23,5% of the total population of the country. In 1991, the Hungarian speaking population of Slovakia was 608,000, representing a 11,2% of the total population. The first document to protect the rights of the Hungarians of Slovakia as a minority was signed in 1919 at Saint German en Laye between Czechoslovakia and the Central Powers. This document was the basis for the Czechoslovak constitutional ratification of 19201 and subsequent language laws promulgated until 1926. 2 These documents govern the rights won by the Hungarian population of Slovakia, the successor state to former Czechoslovakia. Although section 2, article 5 of the "International Covenant on Civil and Political Rights" specifies those rights, current Slovak legal practice does not recognize these categories of rights. This document is part of the Slovak legal framework. The continuing process of deterioration of the rights of Hungarians in Slovakia is partly due to this deficiency in the legal practice and partly due to the lack of political will on part of the majority population to remedy those deficiencies the Hungarian population is entitled to. A contributing factor to the existence of this political atmosphere in Slovakia was that the Constitution promulgated in 1992 derived the state and the constitution itself from the Slovak nation rather than from the concept of equality among its citizens. In practice, the rights obtained by the Hungarian minority in 1920 have disappeared. Although it is true that the constitution amended in October of 1968, gave an impetus to the original rights, they never really materialized. 5 In any event, the constitutional modifications of January 1991 regarding human rights, superseded the constitutional amendment of 1968 without providing for a protection clause renewal. Similarly, the current Slovak constitution is not helpful in this regard. 1. An official language law was promulgated providing the legal framework for the official use of the Slovak language not only in official communications but also in everyday commerce, in the administration of religious bodies, and even in the realm of what is normally considered private interaction, for example, communications between patient and physician. In all communities which include a Hungarians population and where there is no school or there is no Slovak school, wherever possible a Slovak school should be opened, but not a Hungarian one. Another source of impediment for the reconciliation of Slovak and Hungarian society is that each views the past, present and future differently. Regarding the past, there is practically nothing to agree on. There was ample evidence of this when in 1996 the Hungarians commemorated the 1100 anniversary of the foundation of the Hungarian state and the Slovak state apparatus, at the initiative of the opposition and with public opinion approval, could launch attacks against Hungarian celebrations and memorials. In terms of the present, a consensus may be possible with those Slovaks opposed to the current government policy, to the attacks of the Prime Minister against the President, and to the continuous infringement of parliamentary democracy by the government coalition, and to the methods of the privatization process. Regarding the future, the most noticeable difference is the fact that the Slovaks cannot accept the Hungarian perspective for the future of their community. Nearly 90% of the Hungarian population supports Slovakia's membership in NATO and the European Union, while, on the average, Slovak support hardly reaches 50%. Although Hungarian political platforms do not reject the Slovak state, neither did they support its inception before 1993. The Hungarian members of parliament did not vote either for the declaration of independence or for the Slovak Constitution, because both documents include emphasis on Slovak ethnic nationality. The Slovak state came into existence equally without the participation or aspiration of the Hungarians as did Czechoslovakia in 1918 and 1945. The Hungarian community accepts as a reality the fact that their historic and native land is now in a country that shows enemity towards the community. The Hungarians' way out of this dilemma is to pursue European integration while promoting cooperation with those Slovaks capable of reaching common ground on certain issues. The Hungarians of Slovakia do not want to be excluded from NATO and do not even favour a Schengen Agreement dividing line with other parts of the Hungarian nation. Of these three concepts so far none has found favour in the Slovak political world." Fisher, Sharon "Meeting of Slovakia's Hungarians Causes Stir" RFE/RL Research Report, 3 (4), January 28, 1994, pp. Fisher, Sharon "Möte i Slovakiens ungrare Orsaker Rör" RFE / RL Research Report, 3 (4), 28 januari, 1994, pp. 42-7. Reisch, Alfred A. "The New Hungarian Government's Foreign Policy" RFE/RL Research Report, 3 (33), August 26, 1994, pp. Reisch, Alfred A. "Den nya ungerska regeringens utrikespolitik" RFE / RL Research Report, 3 (33), August 26, 1994, pp. 46-57. Reisch, Alfred A. "Hungarian-Slovak Relations: A Difficult First Year" RFE/RL Research Report, 2 (50), December 17, 1993, pp. Reisch, Alfred A. "ungerska-slovakiska förbindelser: en svår första året" RFE / RL Research Report, 2 (50), 17 december 1993, pp. 16-23. Reisch, Alfred A. "Slovakia's Minority Policy Under International Scrutiny" RFE/RL Research Report, 2 (49), December 10, 1993, pp. Reisch, Alfred A. "Slovakiens minoritetspolitik Enligt internationell kontroll" RFE / RL Research Report, 2 (49), 10 december 1993, pp. 35-42. Reisch, Alfred A. "The Difficult Search for a Hungarian-Slovak Accord" RFE/RL Research Report, 1 (42), October 23, 1992, pp. Reisch, Alfred A. "det svåra sökandet efter en ungerska-slovakiska Accord" RFE / RL Research Report, 1 (42), 23 oktober, 1992, pp. 24-31. Reisch, Alfred A. "Hungarian Ethnic Parties Prepare for Czechoslovak Elections" RFE/RL Research Report, 1 (18), March 1, 1992, pp. Reisch, Alfred A. "ungerska Etniska parterna Förbereda Tjeckoslovakiska val" RFE / RL Research Report, 1 (18), 1 mars 1992, pp. 26-32. Minorities at Risk Phase I Report. Minoriteter at Risk Fas I rapporten. Lexis/Nexis news reports, 1990-2003. Lexis / Nexis nyhetsinslag 1990-2003.